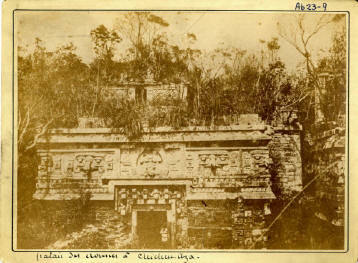 "The Maya name "Chich'en Itza" means "At the mouth of the well of the Itza." This derives from chi', meaning "mouth" or "edge", and ch'e'en, meaning "well." Chichen Itza is the most visited archaeological site in the peninsula of Yucatan, due to its extraordinary architecture beauty and its geographical location. 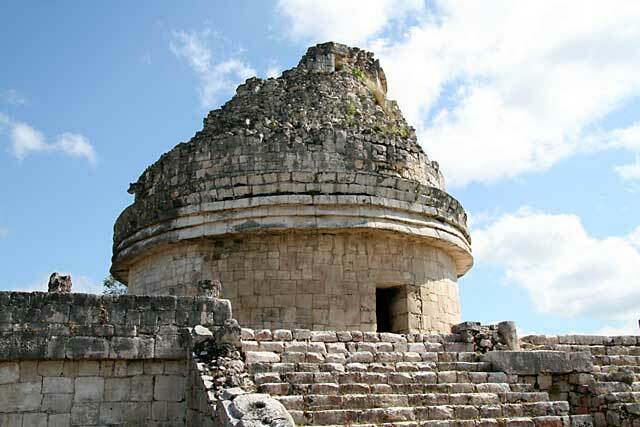 It is located 120 km from Merida (about midway between the towns of Cancun and Merida) in the State of Yucatan, Mexico. 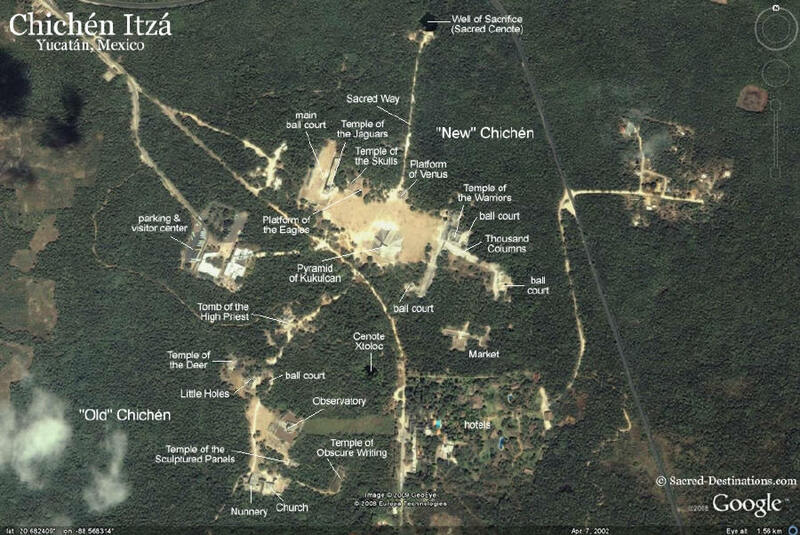 Below is an interactive Google Earth satellite map of Chichen Itza. Use the buttons on the map to zoom in; drag the map with your mouse to move around. Click on any image icon to enlarge. Chichen Itza, Mayan culture, late classic, 11-13th A.D. The site was developed between the 6th and 14th centuries. The early inhabitants (A.D. 600-900) were the ItzÃ¡, a Maya group. Chichen Itza seems to have been abandoned during the 10th century but later resettled around A.D. 1000. 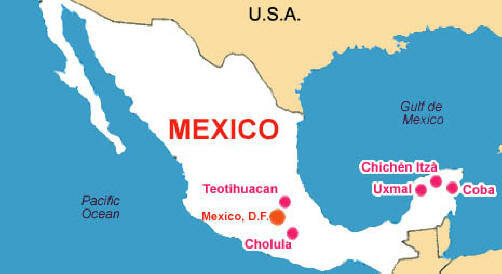 The second group of settlers may have been the original ItzÃ¡, Toltecs from Tula (near Mexico City), or a fusion of both groups. 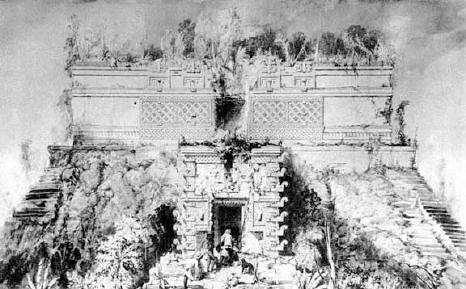 Archaeologists have recognized both Maya and Toltec influences in the architecture: most believe that the Toltecs influenced the Itza, but some argue that the influence was in the other direction. It was founded in the year 514 of our era by the priest LAKIN CHAN who was also called Itzamna. This is why their people were called since the foundation, chanes or itzaes. The name Chichen Itza, is derived from the Mayan language: "Chi" - mouth, "Chen" - well and "Itza" - the tribe that inhabited the area. 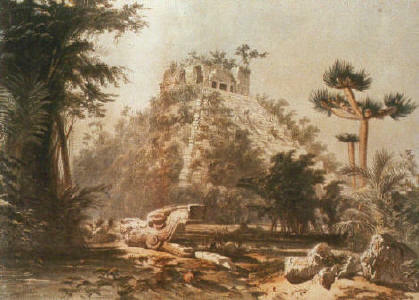 When the Spaniards arrived to Chichen - Itza, it had been abandoned as a consequence of the civil war fought with Mayapan. In between 1196 and 1441 the final collapse of this culture took place in the north of the peninsula. 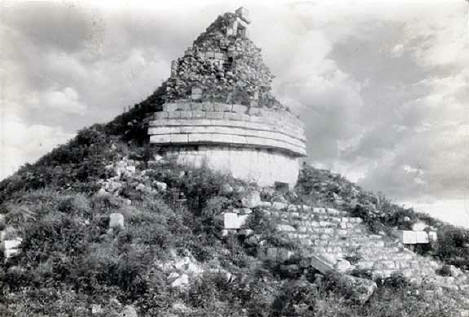 The conquerors found the buildings of Chichen Itza, partially in ruins and their names and real use were unknown; this is why the present names are suppositions. 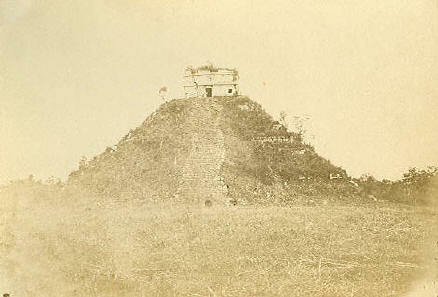 About 60% of El Castillo pyramid has been restored almost fully from the decaying condition in which it was re-discovered by John L. Stephens in 1841 although the eastern and southern faces are still partially eroded by the forces of time and erosion. 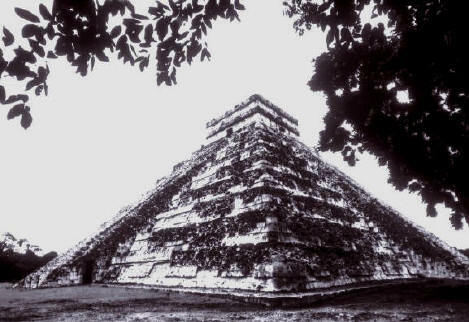 There are no plans to restore these two faces of the pyramid as those that restored the other portions wish for future generations to see the condition in which it was originally discovered. 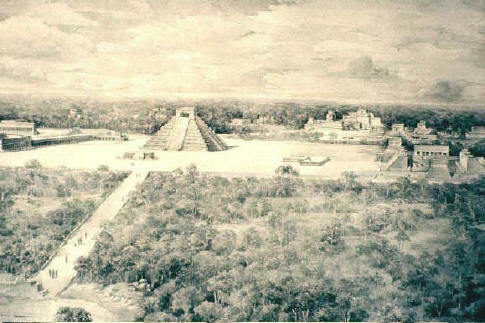 Artist's rendering of central Chichen Itza around the year AD 1,000. Temple of the Warriors to the east, and a sacbe to the Sacred Cenote in the foreground. 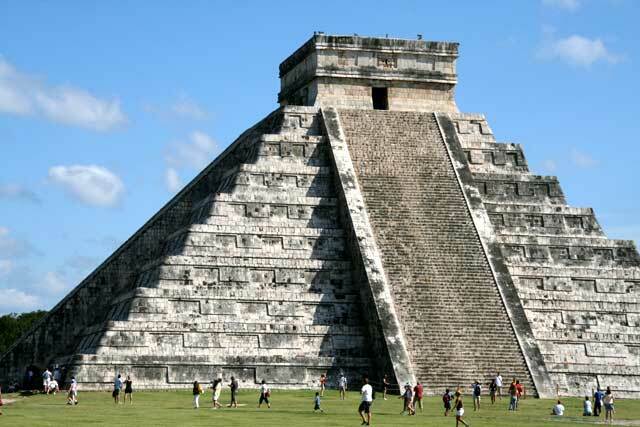 Chichen Itza is the most impressive and intact ruins of Mayan civilization that the modern world has. This now popular tourist attraction is located on the Yucatan Peninsula of Mexico and has fast become the best restored record of the spiritual, domestic, and agricultural lives of these people. Mayan ruins in central America, such as Chichen Itza, are remnants of cities that were abandoned long before Columbus reached the area; yet this culture has influenced many areas of architecture, art, and astronomy, that live on even in our modern world. The Mayan people are most famous for their brilliant and advanced astronomical knowledge and their resiliency. Stone remnants of their civilization are currently being preserved at various sites in Mexico; in Tilkal, Guatemala; in Altun Ha, Belize; and in Copan, Honduras. Mayan civilization spread from their origin on the Yucatan Peninsula to the rain forests of Mexico eastward and the other surrounding countries. Today, mostly on the Yucatan Peninsula and in the state of Chiapas, Mayan culture is still thriving with four to six million people, over 30 languages, and many ethnic backgrounds represented. 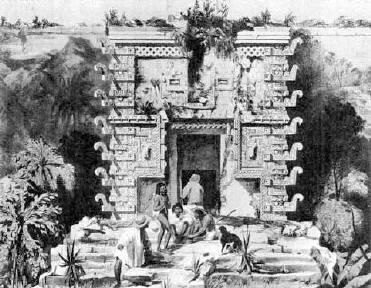 Modern Mayans still continue many of the traditions of their ancient culture, such as speaking their ancient dialects instead of Spanish, growing their traditional crops (corn, beans, chile, tomatoes, and squash) with the same techniques, and using herbal medicinal treatments instead of modern medicine. Many spiritual aspects of Mayan life, the purpose for their ancient cities, is still exercised with many offerings and pilgrimages to modern churches, sometimes fusing Catholicism with Mayan beliefs from antiquity. 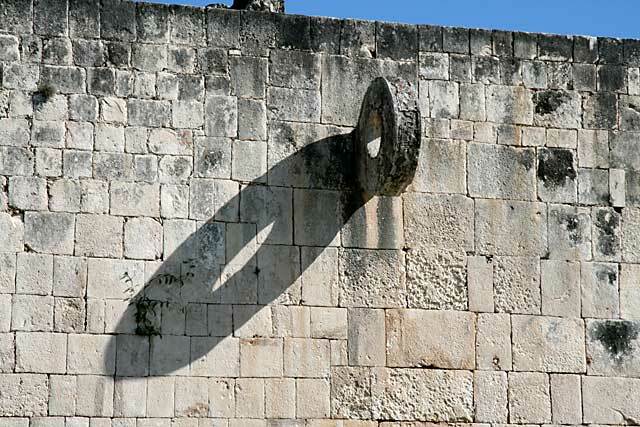 Around 550 AD, Mayans settled Chichen (translated "the mouth of the well") around two wells; one sacred and one "profane," used for everyday use. These underground wells and subsequent waterways, known as "cenotes", were the lifeblood of the community. Chichen Itza was primarily a rain forest area settled on flat, porous limestone that rain seeped through to became trapped in the insolvent bedrock below. These cenotes were, therefore, the oasis of the society, full of rain and run off water for their living needs. 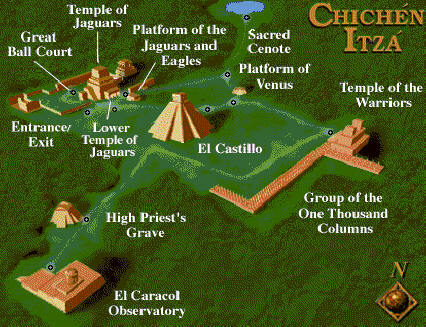 Chichen Itza, like most Mayan centers, was primarily a spiritual, ceremonial site instead of a commercial area. The loose arrangement of decentralized farming communities came together for offerings, sacrifices, and ceremonies in the town. Some trade, education, and recreation were also performed there. Exhumed from the sacred well were many ceremonial objects, skulls, and entire skeletons. Evidence suggests that Chichen Itza was abandoned by the Mayans in the tenth century. 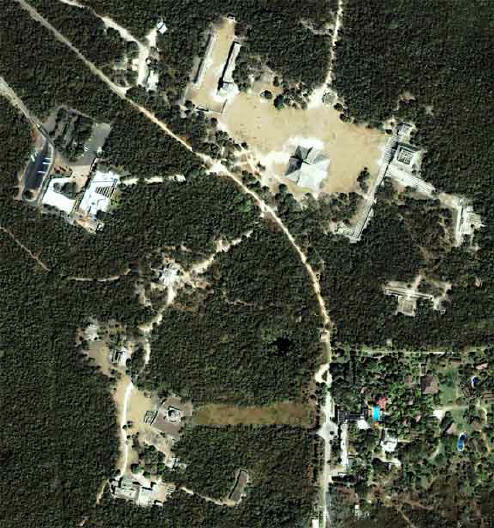 This is concurrent with evidence of all Mayan cities being abandoned around this period. The abandonment has not yet been fully explained. The Mayans returned to and resettled their cities around 1000 AD. Chichen Itza's architecture is seen to have two distinctive styles; traditional Mayan architecture, and more recent Toltec architecture. 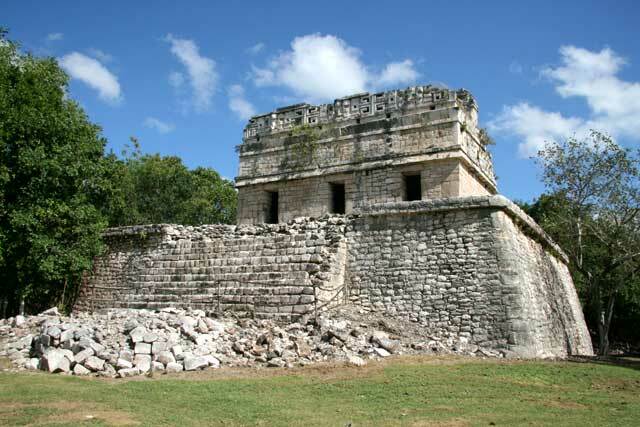 The Toltecs were another more warlike tribe who invaded Chichen Itza around the year 800 AD. The Toltecs were much more fierce than the Mayans and human sacrifice was a large part of their rituals. 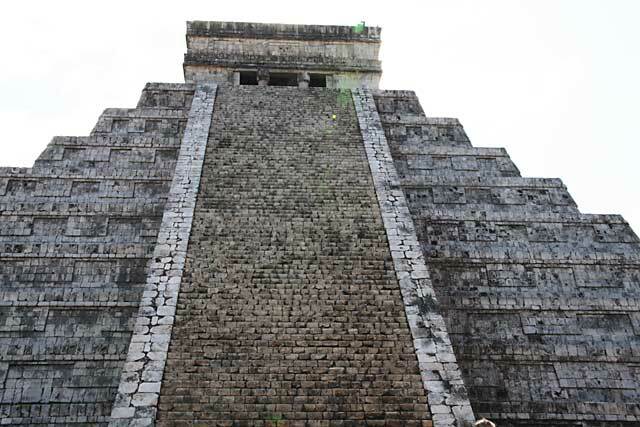 It is quite easy to decipher which structures in Chichen Itza were built before and after 800 AD. Book 2 "SURPRISE WITNESS" shows what happened DURING that great Deluge - the cosmic calamity that ripped the Earth to shreds and wiped out the original Mother Civilization. Not only were the antedeluvian people buried, but their technological achievements were destroyed, including all form of machinery and construction. The skeptic may shout himself hoarse. But this event surely happened. We have evidence that is more substantial than for any other event of history. Book 3 "The Corpse CAME BACK!" Now comes the fast moving, fascinating story of the settling down of Planet Earth AFTER the Flood, and its effect upon human history.